The fall foliage season in the North Carolina Mountains is a beautiful spectacle that is brought about by the gradual change in the color of the mountain foliage on the Blue Ridge Mountains and the Great Smoky Mountains. The autumn change in the color of the foliage is caused by the low autumn temperature, which slows down the production of chlorophyll and make the leaves to turn yellow. The foliage at the top of the hills start to turn earlier than the foliage at the bottom of the mountains because of the cooler temperature at the top of the mountains. Therefore, the change in the color of the foliage starts at the highest elevations of the mountains in the first week of October and works its way down the mountain by mid-November. This varied elevation of the Blue Ridge Mountains and the Great Smoky Mountains create the best conditions for tourists to view the foliage coloration. When Is The Peak Color Of The North Carolina Mountain Foliage? The foliage at the elevations of 4000 feet and above turns within the first 2 weeks of October. The areas within this elevation are Alum Cave Bluffs, Clingmans Dome, Newfound Gap, Mount LeConte, Andrews Bald, Ramsey Cascades, Chimney Tops, and Balsam Mountain. Elevations between 2000 and 3000 feet peak in the middle of October and early November. Cades Cove, which is at the elevation of 1716, will be one of the last areas of the mountain to peak. The peak time for Cades Cove is late October or early November. The North Carolina Mountain cover a large area. 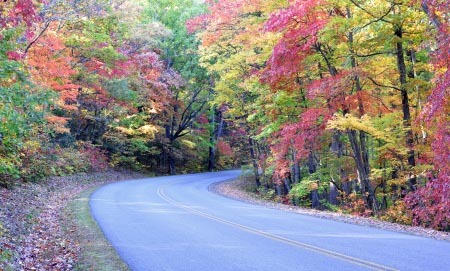 Therefore, if you take a mountain tour along the Blue Ridge Parkway or along the other mountain roads at any time in October, you are going to find a spot to view the foliage in its peak. We have over 30 parcels of properties for sale in the South Mountains. The properties range from 1 to 10 acres which we are selling as low as $29,900. The properties are strategically located to give you the best view of the mountain ranges. They are also near a community lake which is stocked with fish where you can go fishing during your days off. For more information about the Western North Carolina mountain property, call us at 828-475-4844 to schedule a showing or to request a free brochure.